Smart farming systems have applications which cover most of the farming types including precision crop farming, livestock monitoring and management, indoor farming, aquaculture, and others (forestry and orchids). Over the last decade, the global agricultural industry has witnessed a massive transformation owing to the increasing demand for sustainable farming practices. Rising global population and high income growth have resulted in growing concerns of food security across the world. Various agricultural start-ups and technology innovators are developing numerous sustainable farming systems. With the rapid employment of smart farming solutions, farmers are able to enhance production yield by increasing inputs and efficient management of farm enterprises. The advent of innovative farm management techniques has resulted into reduced energy consumption and overall cost-effective operations, owing to their more precise and resource-efficient approach. As a result, the smart farming industry is anticipated to progress, due to the ever growing affinity for more convenient and smart farming solutions than the traditional methods. The market research study offers a wide perspective of the different types of solutions and applications pertaining to smart farming and analyzes its impact on the farming sector, by providing critical insights into the direction of its future expansion. The research is based on extensive primary interviews (in-house experts, industry leaders, and market players), and secondary research (a host of paid and unpaid databases), along with the analytical tools, that have been used to build the forecast, and the predictive models. The report is a compilation of various segmentations including market breakdown by solutions, applications, and region. Moreover, the report also consists of an additional section of agricultural robots for smart farming. Market segmentation of agricultural robots in smart farming on the basis of type and application has also been evaluated. The report highlights the key driving and restraining forces for this market as well as the market opportunities in different segments of smart farming, such as crop production, livestock management, indoor crop production, and aquatic species farming, among others. • What is the global smart farming market size in terms of revenue from 2017-2022 along with the growth rate during the forecast period 2018-2022? • What is the revenue generated by the different solutions such as hardware systems, software, and services for the smart farming market? • What is the market size of smart farming solutions for different applications including precision crop farming, livestock monitoring and management, indoor farming, aquaculture, and others? • What is the smart farming market size for different regions on the basis of various solutions and applications? • What are the key trends and opportunities in the market pertaining to countries included in different geographical regions? • How attractive is the market for different stakeholders present in the industry by analyzing the futuristic scenario of smart farming? • What are the major driving forces that are expected to increase the demand for smart farming during the forecast period? • What are the major challenges inhibiting the growth of the global smart farming market? • What kind of new strategies is being adopted by the existing market players to expand their market position in the industry? • What is the competitive strength of the key players in the smart farming market by analyzing their recent developments, product offerings, and regional presence? • How are agricultural robots transforming the contemporary farming practices? The report further includes a thorough analysis of the impact of the five major forces to understand the overall attractiveness of the industry. The report also focuses on the key developments and investments made in the smart farming market by the players and government. Further, the report includes an exhaustive analysis of the regional split into North America, Europe, Asia-Pacific (APAC), and Rest of the World (RoW). Each region details the individual push and pull forces in addition to the key players from that region. Deere & Co., Trimble Inc., AGCO Corporation, Raven Industries, GEA Farm Technologies, Lely, Afimilk Ltd., Allflex Inc., Vertical Farm Systems, AeroFarms, Signify Holding, Osram Licht AG, Harvest Automation, and AKVA Group are some of the prominent players in the smart farming market. 8.7 SST Development Group Inc.
Farm productivity across the globe has been significantly increasing since the last decade. With the exponential growth of world population, subsequent rise in the global demand for food, shrinking agricultural lands, and depletion of finite natural resources, the need to enhance farm yield has become critical. The increase in urban population in developing countries with the enhancement of quality of living due to high income levels and the demand for fresh crop produce and animal protein are boosting the demand for crop production. Limited availability of natural resources such as fresh water and arable land along with slowing yield trends in several staple crops, have prompted growers and companies in the farming sector to introduce innovative and advanced smart farming techniques for increasing farm profitability. The farming industry has witnessed numerous revolutions over decades starting from the domestication of livestock and crops to the organized use of crop rotation using new farming techniques. This was followed by the large-scale usage of fertilizers and pesticide and systematic breeding called as the green revolution. Finally, with the introduction of Information and Communication Technologies (ICT) in farming since the last decade, the farming industry has been witnessing another revolutionary phase. Broadly, utilization of internet of things (IoT) technologies by integrating them into smart farming equipment reduced exploitation of resources and offered site-specific farming. These technological advancements in the farming practices and equipment represent a technological revolution which has the potential to create disruptive changes in the farming industry. Utilization of technology to make farming efficient and cost-effective with reduced negative impact on environment is termed as smart farming. The smart farming market is projected to grow significantly during the forecast period from 2017 to 2022 with a robust growth rate. High growth in the market is expected to be driven by the need to apply site-specific farming and variable rate application of raw materials and resources as per the requirements. Deployment of automation and control systems to steer the application of agricultural inputs along with sensing systems to monitor the need is expected to be crucial to augment the growth of the market. Smart farming is also expected to reduce the ecological footprint of daily farming. In emerging countries, growth is expected to be driven by rising awareness among the governments of different countries about the need to elevate farm produce in an environment-friendly manner. The smart farming market encompasses a wide array of solutions such as hardware systems, software, and services. Hardware systems involve a system that combines the equipment supported by the software solutions. Additionally, these hardware systems comprise automation and control systems, sensing and navigation systems, and indoor farming equipment, among others. 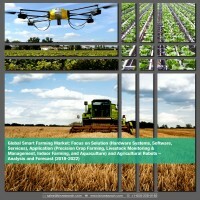 In 2017, the major market share of the total smart farming market was held hardware systems, followed by the software products. Moreover, the smart farming market for the services segment is expected to display an optimistic growth. A lack of technical expertise among the stockman has resulted in an increasing demand for the smart farming services especially the integration and deployment of farm equipment, wherein, the companies provide full-range solutions for farm management starting from installation to farm record keeping. Smart farming systems have applications which cover most of the farming types including precision crop farming, livestock monitoring and management, indoor farming, aquaculture, and others (forestry and orchids). Precision crop farming application area accounted for the largest share of the total revenue generated by smart farming solutions in 2017. With growing need for appropriate usage of agricultural inputs, variable rate application products in the market are expected to propagate further growth of precision crop farming in the smart farming market in the coming five years. During the forecast period, livestock monitoring and management and indoor farming application areas are expected to witness high market growth. Smart farming solutions are also offered for multiple aquaculture application types including feed management, aquatic species tracking and navigation, and water quality management, among others, whereas indoor farming application areas are expected to display the highest growth rates. Indoor farming application types comprise HVAC management, lighting management, and plant development monitoring, among others. The trends of the smart farming market vary across different geographical regions. The smart farming market holds a prominent share in various countries of North America, Europe, Asia-Pacific (APAC), and Rest-of-the-World (RoW). Presently, North America is at the forefront of the global smart farming market, with high market penetration in the U.S. However, Mexico is expected to have the highest market growth in the coming five years. Moreover, the Asia-Pacific region presents immense scope for market development, owing to the increasing urban population size and growing market penetration of internet in farm management and favourable government investments. Decreasing agricultural labor in most number of countries is prompting farmers to turn to automated farming systems and agricultural robots. With companies investing heavily in robotic systems and rolling out new products regularly, agricultural robots are expected to exponentially augment the growth of the global smart farming market. Amongst UAVs/drones, harvesting and picking robots, milking robots, and other robots, UAVs/drones generated the highest revenue in 2017. It is also expected to grow with the highest growth rate during the forecast period due to its increasing product applications. In 2017, the maximum robot deployment was done for crop management. The competitive landscape for the smart farming market demonstrates an inclination toward companies adopting strategies such as product launch and development and business expansions and contracts. The major established players in the market are focusing on product launches and developments to introduce new technologies or developing further on the existing product portfolio. Deere & Co., Trimble Inc., AGCO Corporation, Raven Industries, GEA Farm Technologies, Lely, Afimilk Ltd., Allflex Inc., Vertical Farm Systems, AeroFarms, Signify Holding, Osram Licht AG, Harvest Automation, and AKVA Group, are some of the prominent players in the smart farming market. The market is highly fragmented with the presence of a huge number of small-sized to medium-sized companies that compete with each other and the large enterprises. Moreover, extensive R&D activities and appropriate regulatory environments are also a prerequisite for the sustained growth of this market. Various government and private research institutes and favorable trade policies are putting in substantial efforts to identify the benefits of these smart farming solutions for augmenting global food production. The need for sophisticated smart farming techniques is necessary to bridge the demand and supply gap along with attaining sustainability in the production.